Your slow cooker is far more versatile that you may have first thought. Yes, it’s perfectly suited to soups and stews, with even the cheapest cuts of meat falling off the bone after a long cook with vegetables and stock or wine, but there is far more you can cook in your slow cooker. Here are five ideas for unusual things that you can make in your slow cooker. It’s surprisingly easy to make mango chutney (and various other types of chutney) in your slow cooker. Chutneys make lovely gifts, especially when part of a hamper for Christmas with some good cheddar and perhaps some homemade biscuits. Chop the mango (the tins are loads easier than fresh because often the fresh ones are too under ripe. It also makes this a far-easier ‘store cupboard’ recipe) and add all the ingredients to the slow cooker. Give it a good stir and cook on high for three hours, or five to six hours on medium or low. That’s it! All you need to do is then put the chutney into sterilised jars – add a little raffia and a pretty label for presents. This is delicious on toast, crumpets, as a filling for sponge cakes, on crepes….the list is endless! This is lucky, as it doesn’t keep very long – only up to four weeks in the fridge. Melt the butter, sugar and lemon rind and juice together over a low heat. Put this mixture into a pudding basin or soufflé dish that will fit into your slow cooker (please try first or it will be rather annoying!). Let the mixture cool for a few minutes then carefully add the beaten eggs and stir well. Cover the dish and put into the slow cooker, with hot water coming up to at least half way. Cook on low for about four hours, giving it a stir half way. Spoon the lemon curd into sterilised jars and allow to cool completely, then store in the fridge. 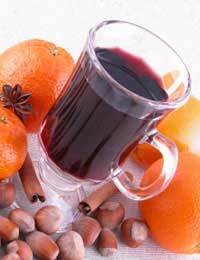 Mulled wine is delicious in the slow cooker. It’s the perfect place to keep mulled wine for parties as people can help themselves and you won’t be worried about it boiling over or boiling dry. Put all your ingredients into the slow cooker and cook on high for 30 minutes to an hour, until you start to see bubbles – you can do this part in a saucepan if you want it ready quicker, although be careful not to boil as the alcohol will evaporate! You can now keep the mulled wine at perfect drinking temperature by keeping it on low, although be careful that any guests helping themselves put the lid back on. You may be surprised to know that you can make a lovely pâté or terrine in your slow cooker, with no worry about it going dry as can happen in a standard oven. Just use this recipe as a guideline and vary the spices and flavouring – just keep the volumes the same. Chop the onions and chicken livers as fine as you like (a coarser pâté requires more roughly chopped pieces). Melt a little of the butter and gently fry the onions and liver, adding plenty of seasoning. After a few minutes, add the finely chopped garlic, cook for a couple of minutes, and add in the brandy. You can flame this if you like. Stir in the herbs and the rest of the butter. Either blend this in a blender if you want a totally smooth pâté (also called a parfait) or leave chunky. Put into a well-buttered terrine dish (you can line this with bacon if you like), cover tightly and place in your slow cooker. Add hot water to half way up the dish and cook on medium for six hours. This doesn’t need a recipe, but you may not have realised that you can cook a whole chicken in your slow cooker (just check it’s big enough). OK, so you don’t get the lovely crispy skin, but we can probably do without the extra fat. You can also use a cook’s blowtorch at the end. Just place a trivet of quartered onions in the base of your slow cooker and place your well-seasoned chicken on top. You can add a small glass of white wine to make a lovely jus. Cook on medium for about 6 hours and serve with vegetables and mash, or fresh baguette and a tomato salad. If you dont have a timer funtion on your slowcooker you can overcome this by using a clock timer plug. Was given a RAN420TS roasting oven. No rack, No instructions. Are any still available? Sorry we are not part of the Cooks Essentials company. Our website merely gives essential information for new cooks. Was given a RAN420TS roasting oven.No rack, No instructions.Are any still available? Why cant some recipes be printed in this form for the "Cook"s essential" digital electric pressure cooker. I for one would be gratefull,as would most of the cutomers who rote reviews on the "QVC"web site in my opinion. cheers billyfish.